Formally , and after a long wait , ratified the Food and Drug Administration "FDA" America, in the early hours of the morning on Saturday to put the drug " Sovospover sofosbuvir" to treat disease Chronic hepatitis C , " c " , or what is known as a "virus C " , and will carry a Business Name Suvaldy "Sovaldi", which represents a sign of new hope for the millions of people infected with " C " in Egypt , which is the first in the world in the spread of this disease . There are new drug in the form of tablets taken by mouth , and very interesting that it has very effective up to 90% in the treatment of type gene Fourth suffering from it the majority of Egyptians , as shown one of the clinical trials , when taken with interferon long-acting and Ribavirin Drug, but the price too high , and the cost of packaging per 28 tablets of it - within the United States $ 28,000 dollars , which is equivalent to 193 thousand Egyptian pounds approx. As revealed by Dr. Hisham Khayat , consultant at the Institute of Liver Diseases Theodore Bilharz , last Wednesday , during a meeting with the program " Good Morning Egypt ," which is broadcast on Egyptian television , the Egyptian pharmaceutical companies have been looking for alternative ways to be manufactured so that it is less expensive . Comes the release of this new drug after less than two weeks just to adopt drug "Olysio" which contains the substance "simeprevir" and is used to treat type gene first "virus C ," which is a story exciting and Sara for tens of millions of patients. " Virus C " on world. The results revealed the effectiveness of the drug " Sovospover " in the treatment of type gene gene second and third , where the response to viral sustainable fantastic , after using it next drug Ribavirin for 3 months , and reached ratio to 93% among patients with type gene II , and 61 % among patients with type gene III , as Studies have shown the effectiveness of large clinical trials - which reached 90 % - in the treatment of type IV gene suffering from it the majority of Egyptians when dealing with a long-acting interferon and Drug Ribavirin. The " Sovospover " is the first drug of its kind , which showed the effectiveness and safety of major for the treatment of some types of the virus, " C " without the need for interferon , and that causes significant side effects , and will happen " Sovospover " major paradigm shift in the treatment of a huge number of patients , according to the statements , Adarod Cox , director of evaluation of antibacterial lotions in the "FDA". And the mechanism of action of the new drug , management indicated the "FDA" that works as a disincentive for the process of consumption Alnyuklutidat in the manufacture of your DNA virus , and inhibits a protein vital needed by the virus C for doubled and reproduction , and can be used by the new drug , either alone or alongside interferon and Ribavirin on by type of injury . 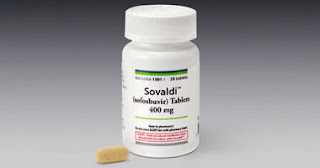 Was sure of the effectiveness and safety of drug "Sovaldi" through six clinical trials , which included 1947 people either did not receive any treatment never virus " C " or did not show any positive response to these drugs , and continued trials of 12 weeks in full , and showed the results the effectiveness of the new drug in the treatment of many types of virus C , and also showed good results with people who did not receive interferon . Among the most prominent side effects that have emerged after taking the new drug next Ribavirin : headache, fatigue , and if eating interferon and Ribavirin , many patients complained of nausea and insomnia, as were anemic . The hepatitis "C" is a viral disease the serious hepatic inflammation , and contribute over time to the deterioration of liver function or liver failure , and often do not show any symptoms of the patients with the virus, " C " until it happens obvious damage to the liver , which requires passage several years to become symptomatic . The company owns the U.S. " Gilead Sciences " , specializing in biotechnology , the exclusive right to market this drug , which is located in Foster City , California.